These E books now £13.50 - iPad, Kindle etc. 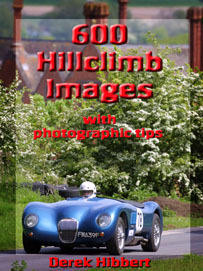 600 Hillclimb images is exactly what it says on the cover. I began motorsport photography in 1972 but this book has an initial section from 1974, then flows into the digital age spanning 2000-2002 with an eclectic mix from various hillclimb venues, some of which are extinct. Though mainly a showcase for images the text has some hints and tips for keen photographers. Finlake to Wiscombe with a few casual portraits thrown in and the odd witty comment. My sense of humour may be evident, especially the caption 'No Stirling it does not say made in Korea'. I doubt the Koreans have ever heard of British Racing Green though they may be aware what a Jaguar C type looks like. This is in a similar vein but with more advice on technique etc. At the moment it is still a work in progress as I intend to visit a few of the mentioned zoos to see if they have made any vast improvements. 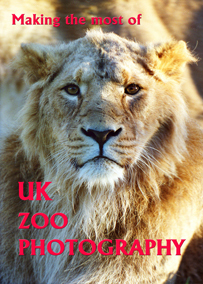 A wealth of images and information on ways to make something taken at Bristol zoo appear more safari orientated. Well we can but dream after all.